Town leaders and schoolchildren joined the San Pedro AIDS Commission for the very important annual AIDS walk. 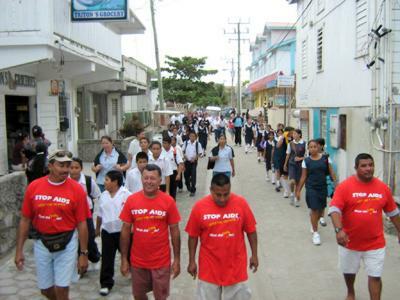 On December 1st, San Pedro Town joined the rest of the world in celebrating World AIDS Day. On this very important occasion, the San Pedro AIDS Commission held a very important annual AIDS walk through the streets of San Pedro Town. Starting bright and early at 7:00 a.m., committee members, along with concerned citizens of the community took their time to show their support on the very important issue. The Ministry of Health released its first quarter report on HIV/AIDS for 2006. According to the statistics, there were 131 new reported HIV infections, 15 new AIDS cases, and 14 AIDS-related deaths. The numbers show an increase compared to the first quarter of 2005, which placed new infections at 99 and new AIDS cases at eight. 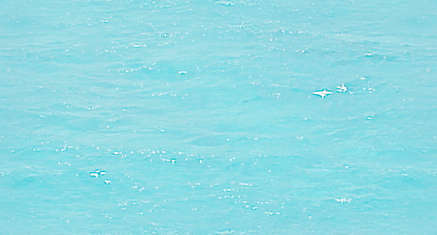 AIDS-related deaths showed a slight dip with January through March 2005 showing 16, two more than this quarter in 2005. In terms of the male to female ratio, the stats show an almost one to one ratio with men accounting for 67 of the new infections and women 64. For men, the age group most affected in the first quarter are those 25 to 34 and 40 to 44, while for women its those between 15 and 29-years-old. HIV stakeholders maintain that Belize is currently experiencing a plateau in the epidemic and in another couple of year the country should start seeing a decline. Last year, the National AIDS Programme reported 434 new HIV infections, a reduction from 2004’s 457. However, the true numbers can only be known when everyone gets tested. However due to discrimination and the fear of stigmatism, many people live with the disease without knowing that they might be infected. San Pedro currently provides FREE HIV testing, medication, and counseling. For further information kindly contact Felix Ayuso at 621-9982.